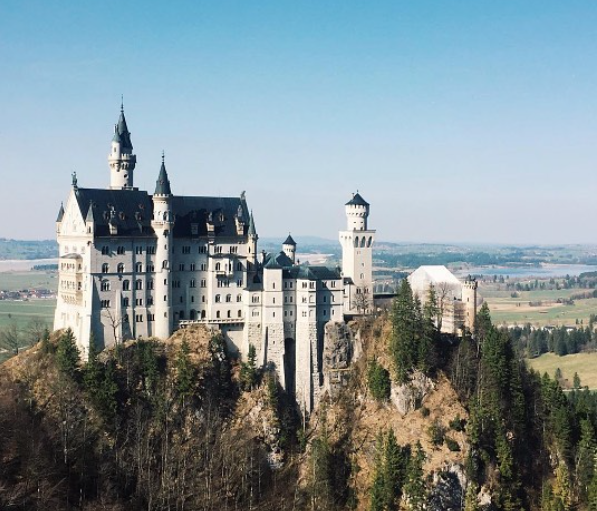 There are lots and lots and lots of magical castles in Germany … but if you’re headed to see Schloss Neuschwanstein, we have your go-to guide. Good luck choosing what to see on a trip to Europe. Even if you narrow it down to a single country like Germany, you could easily spend weeks and weeks exploring all the cities, countrysides and castles. Our best best? Spend a semester living in Europe so you can really soak up all there is to see and do. Seriously, come spend a semester in Europe teaching English! Get more info by chatting with someone who’s been on our program. Should I Visit The Other Castle? Or Even Go Inside Neuschwanstein? 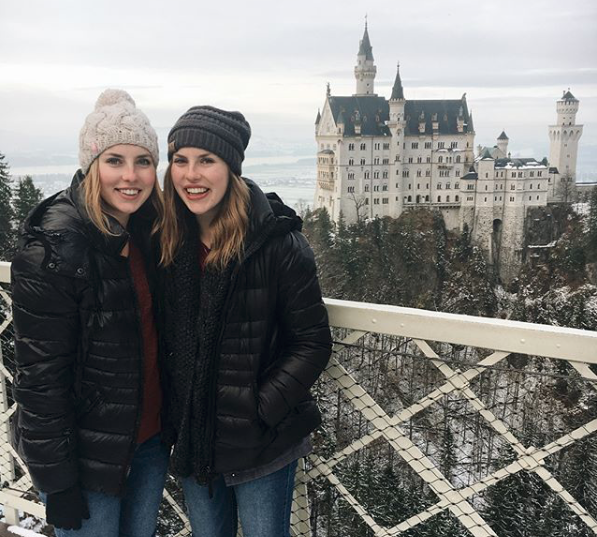 You might know this castle by one of its nicknames, like “The Disneyland castle”; rumor has it that Walt Disney designed Sleeping Beauty's castle after Neuschwanstein. It’s so pretty, we can see why. The history of this place — and King Louis — is pretty incredible (I suggest reading up before you go!) but here it is in a nutshell: King Louis started construction on this castle way back in 1868. He spent his childhood summers in a nearby castle that you can actually visit yourself (called Hohenschwangau ... more on that below). When he grew up, wanted to build a castle to be a place he could escape and hide. He was known to be a bit mad, but add that with a crazily creative imagination, and you get the iconic design of Schloss Neuschwanstein. King Louis put together a team to help build his dream, but he never saw it completed; King Louis drowned in 1886 under mysterious circumstances, I might add. He had only spent around six months in the unfinished space. It was a museum for a bit and now is one of the most popular tourist attractions in Europe — the courtyards, gardens, lavish decorations, all enclosed inside of stunning spires, plus that gorgeous view of the nearby alps is pretty unreal. Get yourself to the south-west German state of Bavaria, which is situated at the bottom of the country, bordering Austria. 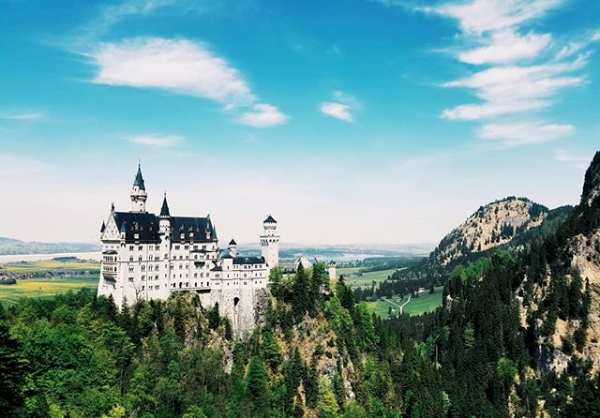 Bavaria is actually pretty large itself (a third of the whole country of Germany), but to see Neuschwanstein, you’ll want to head to the small village of Hohenschwangau. The village is near the city of Füssen, which we’ll talk about a bit later. Regardless of where you are staying, you will need to go through the village of Hohenschwangau to get to the castle. You can stay in the village or in a nearby city or even see the castles on a day trip from Munich, but no matter what you’ll need to get yourself to Hohenschwangau. You need to get tickets to see the castle up close and to go inside; you cannot do it yourself. You can find a few places around Hohenschwangau where you can get a view of the outside if you want far-away look … but the inside is impressive to say the least, and is worth getting a ticket for. It’s better to book tickets online; even if you book online, you will have to visit the ticket booth in Hohenschwangau to pick up your tickets … you cannot print them off yourself. You can buy tickets up to 2 days in advance; you’ll choose a day and a time for your tour. Book tickets online here. If you’d like to buy a ticket in person the day of your visit, plan on waiting in a long line. You might also run into the problem of things selling out (which does happen sometimes before lunchtime in the busy season). We think it's best to book online to secure a spot. There is a 1.80 Euro surcharge to reserve online, but you won’t run into the problem of showing up to a sold out day … so, worth it, right? Ticket office opens and closes one hour before these times. Make sure to check this website for updates (Sometimes carriage rides aren't available or there might be renovations). After you pick up your tickets, you’ll walk up a small hill to view the Hohenschwangau castle from the outside (feel free to walk around if you don't have a ticket); if you have the combined ticket, you’ll get a tour if the inside, getting a glimpse into elaborately carpeted hallways and stunning chandeliers. Gorgeous. 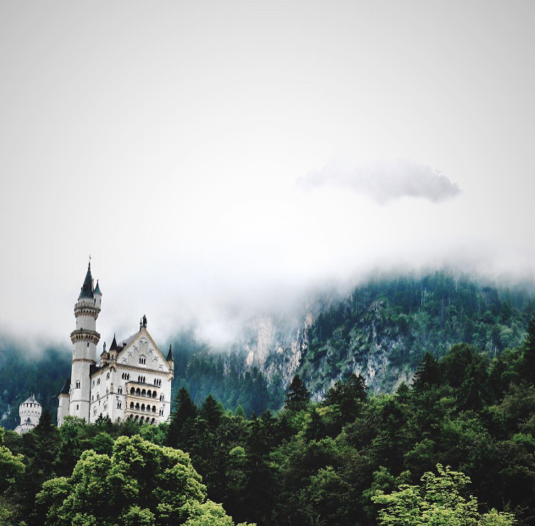 If you just want to see Neuschwanstein, you’ll skip that part and ascend to the castle which is perched atop a hill above Hohenschwangau Castle. You can either walk (about a 45 minute walk up a steep hill), take a horse carriage (6 Euro up hill, 3 Euro downhill) or take a shuttle (1.80 Euro uphill, 1 Euro downhill, or 2.60 roundtrip). You will need a ticket for the next bit — you have to buy them at the ticket booth below or online. There won't be a ticket counter up here. 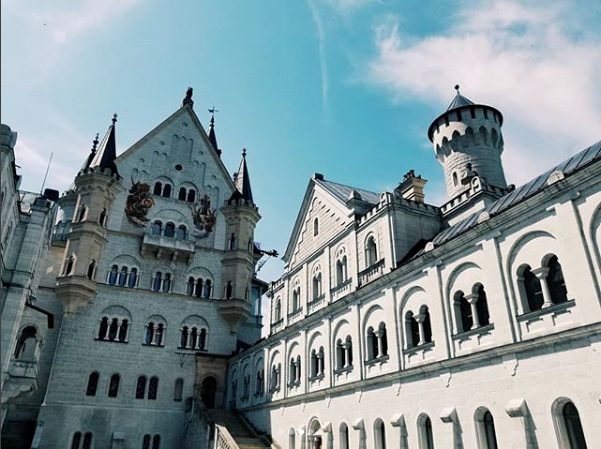 With your ticket, you’ll walk across Marienbrucke — Mary’s Bridge — which you’ll walk across and soak in your first views of Neuschwanstein, perched high in the Bavarian Alps and get a walkthrough of the lavish rooms King Louis wanted to call home. Inside, you’ll admire towering corridors, ornate dining halls, elaborate studies and massively detailed windows. It’s stunning inside and outside, that’s for sure. According to this blogger, there was only a 10 minute wait to get her tickets for the two castles. She arrived at the ticket center at 9:25 AM, and was able to tour both castles with ample time to take pictures and finished at 1:30 PM — you can really do both in a day if you get an early spot and avoid the crowds. You can get to the village of Hohenschwangau from a few cities in Bavaria, but Munich is a good jumping off point if you’d also like to admire this famous city. From Munich Haupbanhof, take a train to Füssen. It takes about 2-2.5 hours, and one-way tickets cost around $30 (plus or minus a few dollars — Look up times and prices here). Once in Füssen, take either the 73 bus (direction Steingaden / Garmisch-Partenkirchen) or 78 bus (direction Schwangau), getting off at Hohenschwangau. Most people will be getting off here, so it’s hard to miss. Once in Hohenschwangau head to the ticket office to pick up your online-reservation, or to buy day-of tickets. Get there about an hour early — If you reserve a 1:00 PM time to see the castle, plan on being in line at 12:00 PM to make sure you don’t miss your slot. You are more than welcome to book a spot in Hohenschwangua, just know that it has lost a bit of its charm. Even though it’s colorful and cute, Hohenschwangau is bursting at the seams with tourists and all that comes with. Plan on higher prices, menus all in English and lots of crowds. It’s very cute, but with all the people and tourism it feels less authentic. However, it is nice that you’re right by the ticket office and the castles, which is ultra convenient. This delightful city is just a short bus ride from Hohenschwangua; take bus 73 towards Steingaden or bus 83 towards Schwangau to get to Hohenschwangau. In Füssen, you’ll find colorful and ornate buildings that scream Bavarian charm, plus the the town is bordered with an emerald green lake and towering verdant pine trees — sans hordes of tourists. Pro tip: You can see both castles and explore what there is to see in Hohenschwangau in a day, no problem. It is nice to arrive to your city (whether that’s Munich, Füssen or Hohenschwangua) either the night before or rather early in the morning so you can have ample time to get to Hohenschwangua's ticket counter and see the castles before you need to leave. Neuschwanstein is definitely the more impressive castle of the two, but Hohenschwangau is still quite pretty. 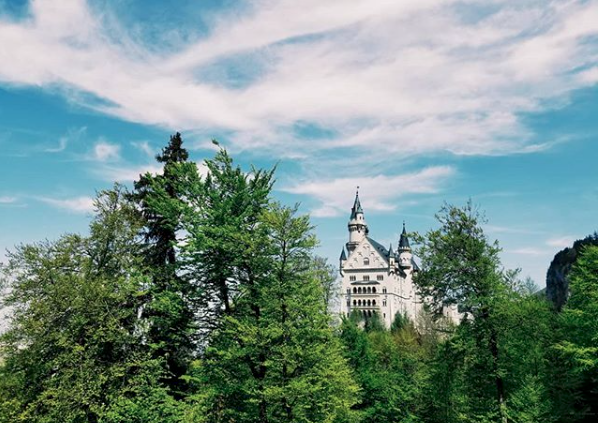 You can admire the outside free of charge and go straight to Neuschwanstein if you’re short on time or money and not feel like you’ve missed anything. From the village Hohenschwangau, you can get a good view to the castles; you can even walk up the hill (or take a shuttle, or a carriage ride) up to Neuschwanstein for that amazing picture you’ve wanted on your Instagram feed, all without purchasing tickets … however …. you did travel all of this way to admire these castles and while the tours inside are a bit touristy, it seems a bit of a waste to come all the way here just to stand outside. If you’re really tight on time and/or cash, you can get by without buying tickets but if you’d really like to experience the castles, get at ticket to go inside Neuchwanstein (and/or Hohenschwangau). Get an earlier ticket time — when you reserve tickets online, you can pick a ticket time to see the castle(s). The earlier times mean you’ll probably get to explore without having to fight hordes of tourists that will arrive on tour buses later in the afternoon. Bring your own snacks. Hohenschwangau is touristy and the prices show it. Either plan on paying a bit more for meals before and after your tour or save some money by bringing your own snacks. That being said, if you’re there in the cold … then a batch of freshly fried quark cheese balls are heaven. Picture a cream cheese based batter that's deep fried and covered in powdered sugar. Mmmm. Dress accordingly! If you have snowy weather, wear lots and lots of layers (like this!). If it’s sunny, wear sunscreen and pack plenty of water. Either way, you will want shoes that are very comfortable to walk in. Even if you pay for a shuttle or a carriage ride up and down the hill from the castle, there is a lot of walking involved. Pack your camera. Your phone can take some pretty pictures, but some of the most stunning shots are of the whole Neuschwanstein castle. Packing up your DSLR will come in handy because you’ll be able to zoom in more than your phone without sacrificing picture quality. Sounds like you're set to explore Germany, but how about calling a country like Lithuania or Ukraine home for a few months? ILP — International Language Programs — can make that happen. ILP's a non-profit organization with years and years of experience sending college-aged volunteers abroad to teach English or volunteer in an orphanage.